Andrew photographed this look for me yesterday and I just love it. It is definitely going to be one of the outfits that I will be taking to Thailand with me. I had a bit of a scary realisation the other day that all of my summer clothes are crop tops and although that has been fine for England, and Maga and every where else I have been it might not be right for Thailand especially for visiting the temples and stuff like that. So this dress is one of the few outfits that I have started collecting that are a little more modest! I also realised that I am going to need a big, strong bag - walking around the markets and doing all the kind of stuff in Bangkok! I was gifted this Zatchels satchel and it's perfect! It's a very sturdy, thick, leather and very safe with its two buckely bits. I'm going to need to keep all my stuff in there as well as Andrews, so it's a great size - Sunglasses, water, wallets, cameras, emergency snacks haha I also love its super cute holographic design - I found it in the kids section! The whole outfit is finished off with my new pair of white converse which I am also planning to wear quite alot on holiday. As much as I love sandals I am quite scared about being in a new country with open toe shoes. I'm a bit weird like that haha I don't like wearing sandals when I go into London as I am scared that someone will stand on my toes so I'm pretty sure I will be spending all my time in Bankok in these! 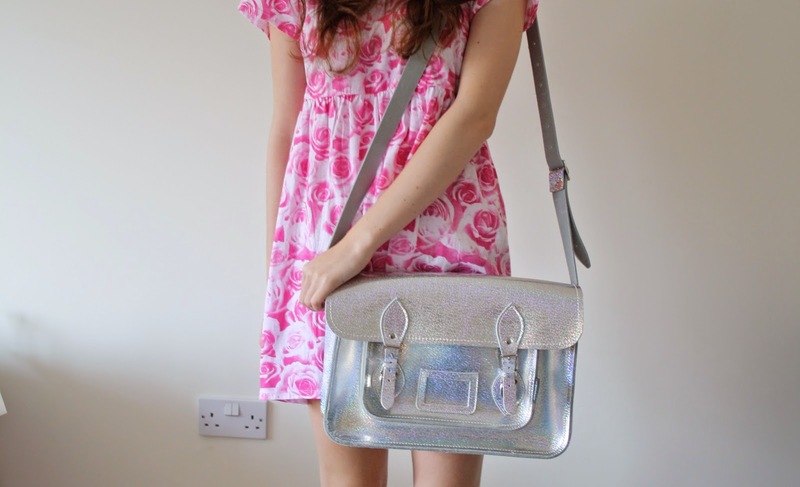 P.S I'd love if you could vote for me in the Matalan Style Challenge this month! Love the print on this dress!